BEST SPECIALIZED INSTRUCTION BOOK OF 2010! 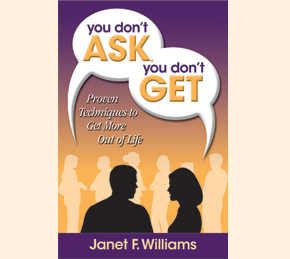 Triple award-winning book, You Don't Ask, You Don't Get is your guide to self-enrichment from small requests that maximize a moment to large requests capable of transforming your life. Learn how to ask for what you want and increase your chances for getting it. Packed with tips and techniques for endless ways to give and receive. GET INSPIRED! 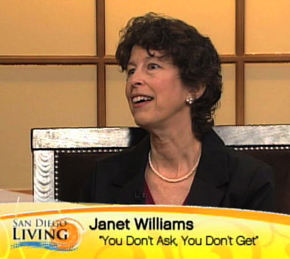 Give your business or social group a boost with Janet’s fresh approach. Content delivered with a sense of humor and designed to meet your needs. 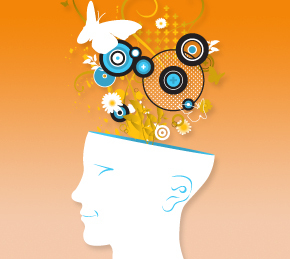 Topics include sales, motivation, stress management, brainstorming, oral and written communications, and author talks. Watch for upcoming writing workshops. Click on above photo to watch TV interview. DO YOU COMMUNICATE YOUR MESSAGE? Reach your audience in the way you intend. Whether you have a manuscript or business writing, Janet can improve your message. She will edit what you have or start fresh with website content, blogging, articles, etc. Fiction and non-fiction. Business and personal. Copywriting, editing, rewriting, content development, critique, structure, and research.